Hanoi (VNA) – Cambodian Prime Minister Hun Sen has announced plans to reform the nation’s economy on a large scale with a 17-point strategy, aiming to stimulate growth and save the private sector some 400 million USD per year in costs. The strategy includes a series of savings initiatives for private businesses, including cutting costs related to transport, port services, and electricity, as well as reforming railway management. It sets out plans to cut the number of national holidays, introduce financial incentives for tax and customs sectors, as well as promote and implement amendments to the Law on Investment and the Law on Special Economic Zones. Speaking at a recent forum on the public-private sector, PM Hun Sen said that these reforms would help increase the competitiveness of export goods if the European Union (EU) decides to remove its preferential trade arrangements under the Everything But Arms (EBA) scheme. In February 2019, the EU officially announced it will begin the process of considering the withdrawal of Cambodia from the EBA scheme on the grounds that Cambodia had violated its conditions. This process will take place over the next 12 months. This causes great concern to businesses operating in Cambodia, especially in the textile sector, which is said to bring about 676 million USD per year to Cambodia. Concerning the current serious power shortage in Cambodia, PM Hun Sen announced plans to split various types of electricity prices for users, thereby reducing about 0.02 USD per kWh for industries that hold high investment value. 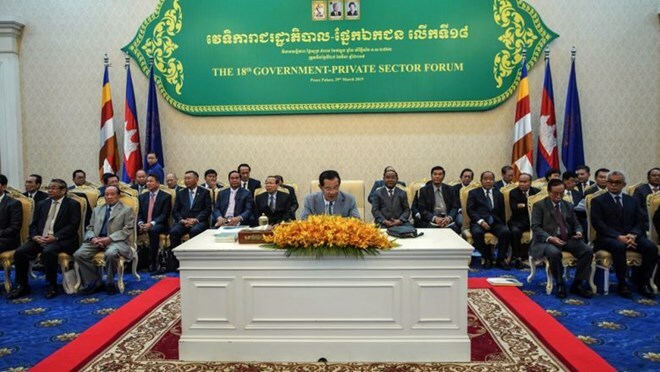 Meanwhile, Vice Chairman of the Cambodia Chamber of Commerce and Industry Lim Heng said that for a long time, the Cambodian private sector has asked its government to issue the aforementioned reforms to help reduce production costs.